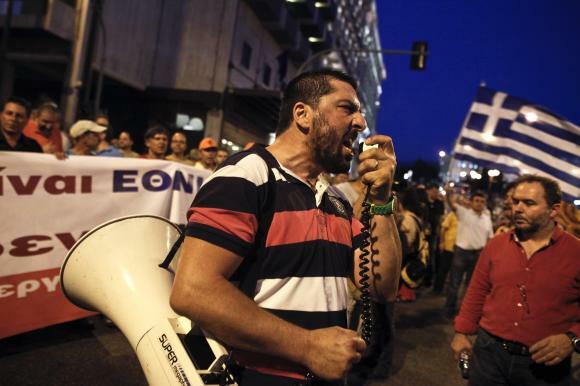 Greek public sector workers have begun a 24-hour strike to protest against continuing cuts in government spending. Hospitals, tax offices, prisons and archaeological sites are expected to be disrupted by the action. The workers are protesting against austerity measures, including a 40% reduction to salaries and pensions. The strike coincides with a visit from Greece’s international creditors to check on the country’s progress. The European Commission, the International Monetary Fund and the European Central Bank – known collectively as the Troika – are monitoring austerity measures that were a condition of a 240 billion-euro ($325 billion) bailout. The lenders have praised Greece’s progress in meeting the targets set. It has achieved a “primary budget surplus”, with its deficit wiped out apart from interest owed on the bailout. After six years of recession, the economy is expected to return to growth this year. After Greece’s high court ruling that recent wage cuts to judges, the armed forces and emergency service workers were illegal and must be repaid, there will be tense discussions about the widening hole in next year’s finances. The nagging question remains about how to bring down a 26% unemployment rate caused chiefly by four years of austerity.